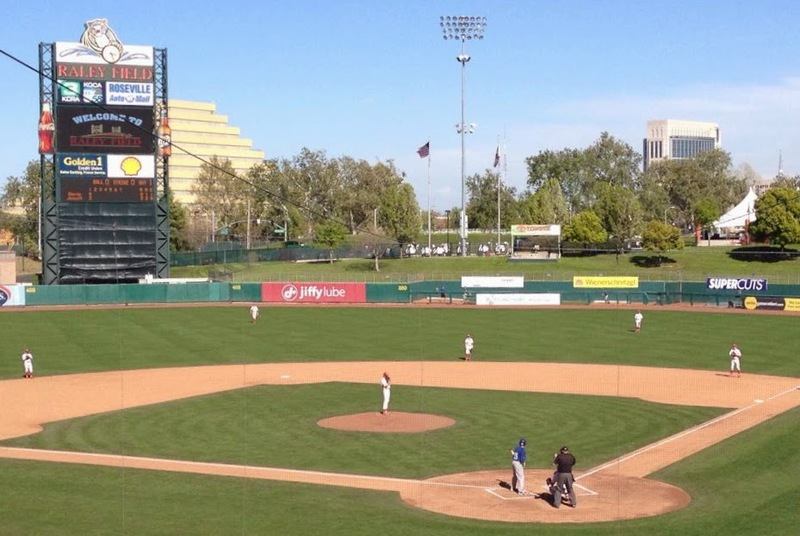 While we were in New Orleans, the Marauders played at Raley Field on Friday, March 21. I was very disappointed to miss this game, but Sharon and I scheduled the trip months before the spring baseball schedule was published. Rod started scoring the game on my iPad. I was following the game on my iPhone while we wandered the streets of the French Quarter. Unfortunately, he got called to work and only scored about half the game. Jack is playing centerfield in this picture. The Jesuit Marauders JV baseball team played the Davis Blue Devils. The Marauders beat the Blue Devils last year by the score of 6 to 0. Leading off, Jack was 0 for 1 with a walk and a run scored. He had a great first at-bat. Jack ran the count to 2 and 2, fouled off a pitch, took a ball, fouled off another pitched and then drew a walk. After Nick struck out, he stole second while Bryce was batting. After Bryce struck out, Jack went to third on a passed ball while Sam was batting. He scored the first run of the game when the second baseman misplayed Sam's ground ball. Jack hit a 1 and 2 pitch for a fly ball out into right field in his second plate appearance. Starting in centerfield, Jack played three innings. He didn't have an assist or a put-out. I found out later that Jack had hurt his ribs diving to make a catch during practice on Thursday before the game. He spent some time with the trainer. The ribs were still sore on Friday. I am guessing this is why they made an early substitution for him. With the score tied 4 to 4 in the bottom of the seventh, the Marauders loaded the bases on a hit by Nick, an error on a ground ball by Jonah and an intentional walk to Sam. Alex hit a sacrifice fly to right to drive in the winning run. The Marauders won the game by the score of 5 to 4. The box score is here and the scorecard is here. Coming in to face the last batter, Stiltner (1-0, 2 appearances, 2.33 innings, ERA 0.00) was the winning pitcher. Wolger and Kane both pitched effectively; each pitched three innings and gave up no earned runs.